Andalusia is a region with many traditions and most have a strong religious connection. 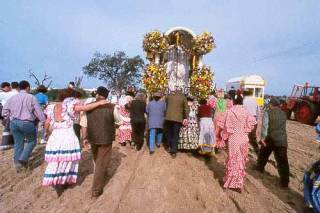 One of the most spectacular festivals that can be seen in Spain is the pilgrimage to El Rocio, which annually draws over one million believers in a small village in Huelva, Andalusia. The village El Rocio has over the year only a few hundred inhabitants, which gives an idea of its small size. The religious festival highlight is associated with Whitsuntide. Over the river from Sanlucar by boat is Coto de Doñana. One of Spain’s loveliest national parks and one of the largest dune areas in Europe, Doñana provides a refuge for endangered species; when spring comes, the sight of flocks of thousands of birds covering the marshlands is an unforgettable one. The only sign of human habitation in 32 kilometers of beach is Torre Carboneras, a 16th-century watchtower. Inland are stretches of dunes and pinewoods. Early this century the German archaeologist Schulten spent several years in the hills known as Cerro del Trigo in a fruitless search for the legendary city of Tartessos. Visitors to Doñana can still see, half-hidden among the pine trees, straw-thatched huts like the dwellings of the former inhabitants of the area, people who lived mainly by fishing and charcoal burning. On the far side of the park is the Acebuche Visitor Reception Centre, where visitors can get information, arrange trips through the park and buy souvenirs. The solitude ends as one nears Matalascañas and the residential estates begin. There is a good metalled road leading to the nearby Sanctuary of El Rocío. El Rocío is a normally quiet village with some bars and restaurants. 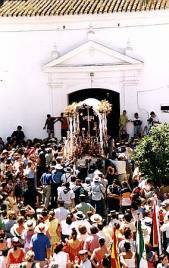 At the Feast of Pentecost, however, the scene changes dramatically with the arrival of the famous Romería, a religious festival in which millions of pilgrims gather to sing the praises of the Virgin – more popularly known as the Blanca Paloma or White Dove – who appeared in the 13th century and has become one of the most important objects of devotion in all Andalusia.